In January of 2006 my wife and I visited Vicksburg, Mississippi. Vicksburg was the scene of a famous battle during the Civil War; Union troops surrounded Confederate soldiers for over two months and blockaded the whole town. There is a military park in Vicksburg that commemorates these events. There are cannons that overlook many of the ridges. There are statues of mounted soldiers with drawn swords or guns. There is a cemetery there with graves of 18,000 Union and 13,000 Confederate soldiers. This military park was a haunting place for me. I kept imagining the roar of guns and cannons and the screams of the wounded. It is a mystery to me why we humans can't find a more creative way of settling our differences, but instead resort to this bloodshed over and over. We made another visit to a place across the Mississippi River in Louisiana that the early settlers called Poverty Point. As they tilled the fields, they kept discovering artifacts from an ancient people. These people have been known as Mound People because of their building of immense dirt mounds for various purposes -- there are a number of mound locations in the Midwest and South. The ancient people of Poverty Point lived in what is now Louisiana from 1500 BC. They were there for about a thousand years and disappeared. A very large mound survives; it is speculated that when it was built, it was about 100 feet tall. In the 1950s when people flew over it they realized that it was in the shape of a bird. Another mound found in Ohio is in the shape of a snake. It appears as if these people were a peaceful lot. They were traders. Trading with others is a peaceful activity. 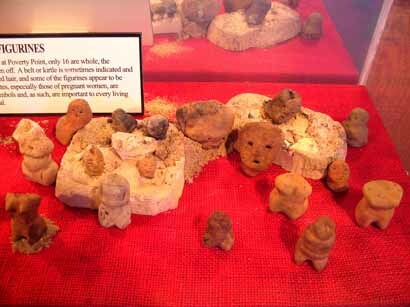 Copper and rocks from as far away the Great Lakes have been found at Poverty Point; the museum at this site shows beads and small primitive sculptures, many with distinctively enigmatic faces. The contrast between Poverty Point and the military park kept rattling around in my brain. I had visited a place of violence and a place of peace a day apart. These places are a mere fifty miles away from each other. What arose out of those thoughts was a vision to create a sculpture park that would pay homage to the people of the past. I have always loved the sculptures of the people of antiquity. My vision of a sculpture park called for inviting people of all races to let these ancient sculptural forms influence new work by the people of our time. I saw it as a way to help bring healing to cultural and historic memories. A few months after this visit to the south, I went to my studio to sculpt, but suffered for four days from what I suppose you could call "artist's block." Nothing would come out right. On the fifth day I switched from clay to wax. What came forth from my hands then were pieces that looked like they were from antiquity. My vision had become part of my whole being; it stopped me from creating something in my old familiar style and led me to pieces that fulfilled my vision. I call these new pieces "The Reconciliation Series." I am inviting other artists to join me to contemplate creative work to bring healing to our culture. I also invite everyone to find ways to bring healing to our attitudes about others and to find ways to bring all humans together.